YANGON, Burma (Morning Star News) – Artillery and air strikes by Burma (Myanmar) government forces on rebel bases in Kachin state in the past week displaced hundreds of ethnic Kachin, a predominantly Christian people long targeted in part because they are not Buddhist. 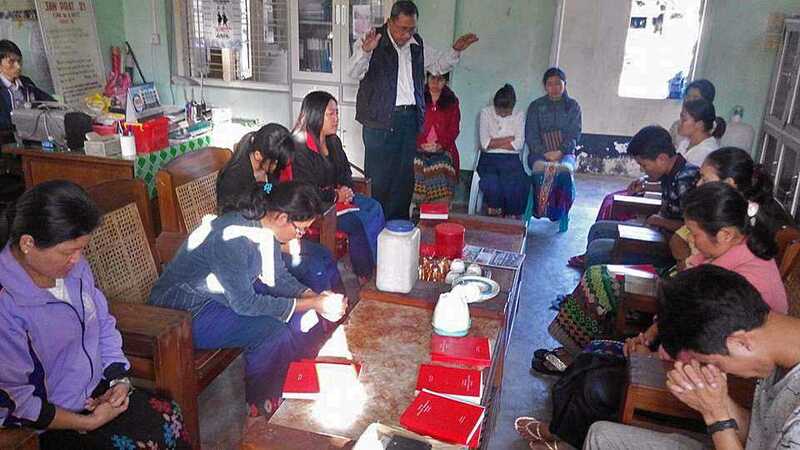 Lama Yaw of the Kachin Baptist Convention, who visited areas near Mohnyin where the offensive intensified on Nov. 15, told Morning Star News by phone that 200 civilians took shelter in area churches after attacks by a jet, helicopter gunships and artillery against the Kachin Independence Army (KIA). Another Christian leader in Mohnyin told The Irrawaddy newspaper that some 300 villagers had fled their homes on Thursday (Nov. 19) and were taking shelter in his church. Pastor Yaw said area Christians were shaken by the attacks, which continued through the week, as they have long seen civilians and church buildings targeted by government weaponry and soldiers. After the Burma Army broke a 17-year ceasefire in 2011, by early 2013 the military had destroyed 66 church buildings in Kachin state, according to a 2013 report by the Kachin Women’s Association of Thailand (KWAT). After making Buddhism the state religion in 1961, the government has tacitly supported military atrocities against civilian Christians. The Kachin are one of several ethnic groups vying for more autonomy, and advocacy organization Christian Solidarity Worldwide (CSW) reports that decades of conflict in the ethnic states have left hundreds of thousands of people internally displaced or as refugees in other countries. “It is obvious that they oppress ethnic minorities who are Christian,” Pastor Yaw said. The roots of conflicts with ethnic groups date back to the origins of the country. Before the formation of the Union of Burma in 1948, British rulers administered “Burma Proper” – where the Burman people lived – and “Frontier Areas,” where non-Burman ethnic groups lived separately. The Kachin leaders, however, agreed to join the Union based on the 1947 Panglong Agreement, which allowed great autonomy and the right to secede to the ethnic frontier states. But with the assassination of Gen. Aung San, who was leading an interim government, and several of his cabinet members, the agreement was forgotten and continues to be violated. Burma on Nov. 8 held its first general elections since the military junta quashed 1990 voting results, but CSW noted political reforms are still fragile. “There are reasons for cautious optimism, but Burma continues to face many very significant human rights challenges, particularly in regard to freedom of religion or belief,” CSW notes on its website. The KIA has an estimated 10,000 troops and is the second largest armed, ethnic group. It was not among eight such groups that signed a ceasefire agreement with the government on Oct. 15. Other major ethnic group forces have declined to sign the agreement, including the Shan State Army-North, which has also been the target of recent Burma Army offensives. Pastor Yaw said Christians in the state capital are praying for villagers living near Mohnyin.